Seersucker is, of course, the iconic cotton-puckered fabric that New Orleans clothier and tailor Joseph Haspel used in 1909 to make the first seersucker suit. It was the perfect suit for southern “bidnessmen” and lawyers in the south in the days before the advent of air conditioning. By the 1920s, its fame had spread to cooler climates in the north, as it was discovered by the Great Gatsby crowd. Undergraduate gentlemen at Princeton began to don it, and it soon spread to other Ivy League and prep schools across the northeastern United States. By the decade of the 1940s, seersucker suits arrived in Washington, and were being worn by America’s leaders, including FDR and Harry Truman. And then in 1962, Hollywood produced a seersucker icon in the persona of Gregory Peck in his memorable, Oscar-winning performance as Atticus Finch in To Kill a Mockingbird. In a hot Alabama courtroom, Peck, as Finch, wore a three-piece seersucker suit as he defended an innocent man, field hand Tom Robinson. Peck’s suit was personally fitted for him by Haspel of New Orleans. On a warm spring Thursday in June of 1996, Republican Senator Trent Lott of Mississippi strode onto the floor of the Senate wearing a seersucker suit, white bucks, and a beautiful pink silk tie and matching pink socks. There he was joined by Democratic Senator Dianne Feinstein of California, also resplendent in a beautiful seersucker suit. 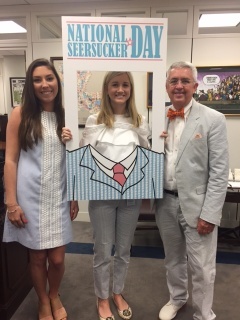 It was the first “Seersucker Thursday,” a bipartisan fashion call in an effort to promote civility in our Nation’s Capital. From 1996 to 2012, both Republicans and Democrats in the United States Senate came together in a bipartisan celebration of the fabric of our Nation, seersucker. It was one annual day marked by fashion and civility in the United States Senate. Well, I am not a politician, much less a member of the United States Senate. I’m just a patriotic American who loves my country, pays his taxes, and wears seersucker. Accordingly, I could not miss “Seersucker Thursday.” With the help of my friend Laurie Haspel Aronson, the CEO of the Haspel Company, I finagled an invitation to Seersucker Thursday from Senator Cassidy. And today, I had the honor to meet with this fine senator and present him and his seersucker-clad Senate colleagues with a copy of Milk & Sugar: The Complete Book of Seersucker. It is the quintessential work on seersucker, and it is written by a very well-dressed attorney from Memphis. And so on this National Seersucker Day, I say it’s time for all of us to practice seersucker and civility. It is a wonderful combination that could bring our nation together. Laurie Haspel Aronson: We missed you this year Bill! We are thrilled that you represented us in Washington DC though. Thank you for continuing to spread the good fashion sense and practicality of SEERSUCKER! Dana Wendt: I wore a Seersucker suit today and received a link to Bill's page about National seersucker day. While I am a yankee, I spent much of my military career in the south buying my first Seersucker suit at Ben Silver's of Charleston (lured in by the loss-leader price on University of Illinois cloisonné buttons). My wife is from Georgia and loves the fact that I still wear then, and only buy the 100% cotton suits. The last from Harwell & Son's of Birmingham. Keep up the good work. I will have a glass of sweet tea with dinner tonight for you, Bill. Frank Crawford: I celebrated a few days early, wearing one of my seersucker suits to preach on Sunday, June 4, and then another to a meeting in Nashville on Tuesday, June 6. It is a Godly fabric! Nick McCall: Only now, at day's end, do I see your latest and I find out about this highly sartorially useful information... sigh. Well, there's always Memphis Seersucker Day, Knoxville Seersucker day, et al. Meantime, wear your seersucker with pride, Bill and all, whether it emanates from Haspel's of N.O., Ben Silver's of Charleston, or other fine haberdashers of note. Cheers.